Mayor Calls Charlottesville "Capital of Resistance"
At a rally on Charlottesville’s downtown mall, the city’s mayor declared it a capital of the resistance, urging residents to stand against what he called un-American values. Sandy Hausman has that story. Charlottesville Mayor Mike Signer declares his city a "Capital of the Resistance," urging residents to resist Trump administration policies that are at odds with American values. About 200 people cheered as Mike Signer attacked President Donald Trump, calling him a demagogue and urging residents to resist a White House ban on refugees and visitors from seven predominantly Muslim countries. Charlottesville’s Mayor listed a series of problems the ban had caused and accused the administration of incompetence. Also on hand, Khizr Khan, the gold star dad who endorsed Hillary Clinton at the Democratic National Convention and offered to lend Trump a copy of the U.S. Constitution. As he began to speak, the crowd turned on a loud conservative blogger who was narrating a video for his followers, demanding he be quiet. Khan continued to speak and later expressed hope that opponents of Trump’s policies would prevail. Kahn signed autographs and posed for pictures with protesters but said he had no plans to run for office. 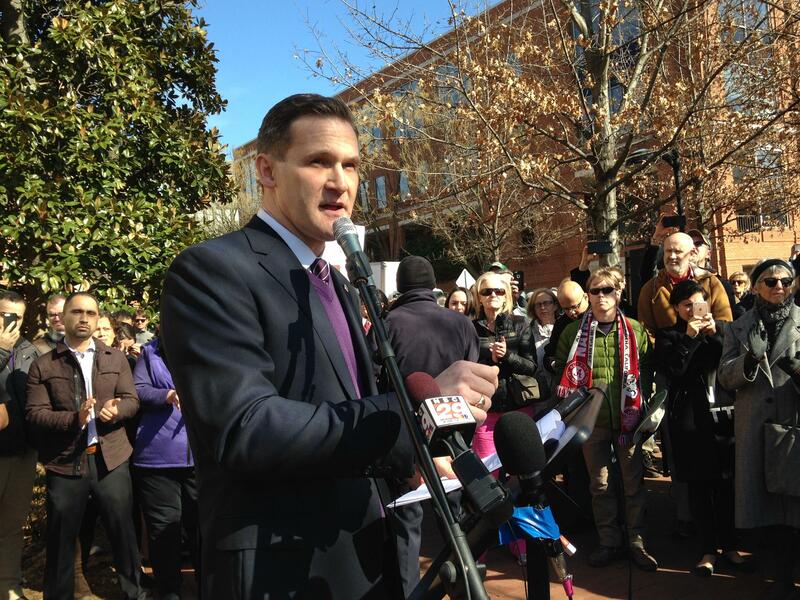 Mayor Mike Signer said he had organized a group of lawyers and law students to help refugees in the months to come, and promised to ask local officials what else Charlottesville could do to protect immigrants.